Brenna recently wrote a post referencing Len Sweet‘s Soul Salsa. 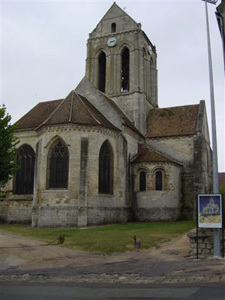 One of Len’s chapters contains a reference to Van Gogh’s painting of the Church at Auvers. My interest in Van Gogh was piqued reading Len’s reference to Van Gogh in Soul Salsa a number of years ago. I have continued to grow in my interest and reading of Van Gogh. I have a large framed print of The Church at Auvers hanging above my computer desk. I have used this piece a number of times in speaking occasions, including sermons. Some time back I purchased Dear Theo: The Autobiography of Vincent Van Gogh edited by Irving Stone. The work is an edited collection of Vincent’s letters to his brother Theo. It is quite a fascinating read. “If one really loves nature, one can find beauty everywhere. I thought of Carol Giligan’s In a Different Voice when I read part of Van Gogh’s letter. One of the oppressive experiences for anyone is to be understood in the categories of another. For example, Giligan argues the distinct ways boys and girls develop should alert us to difference. Yet, in early studies young girls were measure according to the categories outlined in studying development in young boys. Important nuances are missed. When I listened to Scot McKnight talk about man and woman and creation he used a great turn of the phrase, “God split the ‘adam. '” Marriage brings the two back into one. His depiction served in part as an illustration for what it is to be whole. When talking about atonement he (McKnight) asserted we need to view God putting us back together as making us whole. The experience comes as a result of the love of God in Jesus, the Christ. Though we may age we maintain our vibrancy as we are loved and love. We may take Van Gogh’s thoughts and turn them a bit suggesting, “There are no old Christians.” That is not to say there are no old Christians. But, Christians remain young as they love and are loved. Now if we could maintain that kind of vibrancy what different our being loved and loving may make in the world.